This is an example of the early usage of the term Hoklo in Western publications. page 278: "... Took my teacher, Wong, and went on a family visiting tour. The first family visited spoke the Hoklo dialect. The assistant not being with us, we could but partially understand each other..."
"... At a later hour, in company with the assistant, Mr. Young, and Wong, my teacher, visited Titam village, and a family there, who speak the Hoklo dialect; which is nearly the same as Tiéchiú, which the assistant speaks..."
Background: Hong Kong was ceded to the British in 1842. The preacher I.J. Roberts visited a peninsula area of the Hong Kong island named Chekchu, known as Stanley today. This is from the journal of Mr. Roberts. Christianity in China: "Our brethren Ming and Koe have been very active in Hoklo district, visiting every ship that enters the harbor, and offering the treasure of eternal love. Their zeal is indefatigable, and their labors are effectual in finding entrance among the heathen. Inquirers are many, and an increasing number apply for baptism. Two merchants have opened their residences for Christian assemblies, and if the Saviour thus continues to own these weaks endeavors, many of the Hoklo people will be added to his church, whose migratory habits will tend to scatter the tidings of salvation in distant parts through their means. Our brethren are endeavoring to procure a piece of ground on which to build a place of Christian worship." page 168: "... oder Mandarin-Dialekt, Punti, Hoklo und Hakka hwa, welche alle in der Provinz Kwangtung gesprochen werden; dazu wohl auch Hokkien ..."
page 156: "Au nom de l'église Hoklo : « les frères TAN-TUE. TAN-SUN. » Avant de parler des graves événements auxquels cette lettre fait allusion, retournons auprès du ..."
The following paragraph appeared in: Phonetics and Phonology of the Amoy Dialect, by Lo Ch'ang P'ei, Monograph A, No. 4 of the National Research Institute of History and Philology, Academia Sinica, Peiping, 1930. 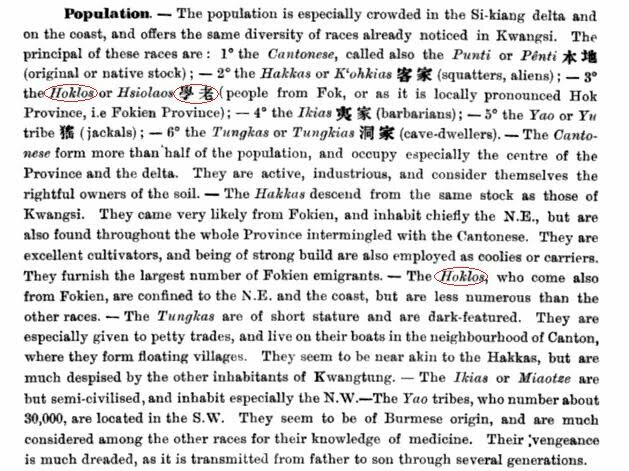 It is clear from this monograph that the author (a well-known Chinese linguist) used the term Hoklo to refer to the superset of all the dialects of this group. The introduction is written both in Chinese and English. The Dialect of Amoy is one of the most important among Chinese dialect groups. Taken in a wider sense, it may be considered to cover the region from Sounthern Fukien, to Ch'ao Chou and Swatow, Hainan, Formosa, the Philippine Islands, Singapore, and other parts of the South Seas, in so far as Chinese is spoken there. The population speaking it is estimated at about twelf (sic) to fifteen million. It goes without saying that in such a vast linguistic area as this, some variations are become (sic) to exist among the different parts of this region. But the speech of Amoy and Kulangsu may be taken as the comparatively most prevailing variety, and the scope of the present study will be confined for the time being to the Amoy Dialect in this narrower sense. For the sake of brevity, we shall simply call this the Amoy Dialect, while the whole dialect group in the wider sense will be known as the Hoklo speech. An electronic search (in 1997) in Britannica Online with the keyword Hoklo gives two referenced items. Hong Kong: Physical and human geography: THE PEOPLE: Linguistic composition. Although English and Chinese are both official languages, English is used for all legal and governmental matters. Chinese, especially Cantonese in the spoken form, is the common language, however, and is almost universally understood. A variety of dialects and other languages are used among the ethnic minorities. Apart from Cantonese, common dialects, such as Siyi, Chaochow, Hakka, Hoklo, and Tanka, are popularly used within separate native communities of the Kwangtung and Hong Kong Chinese. Groups from other parts of China are also likely to use their own native dialects, and p'u-t'ung-hua (Pinyin putonghua), or Mandarin, is gaining popularity in Hong Kong. Similarly, the non-Chinese are likely to use their own native languages among themselves. Archaeological remains of pottery, stone implements, rings, and bronzes found on more than 20 sites are evidence of settlements in Neolithic times. The earliest modern peoples in Hong Kong are thought to have come from North China in the second millennium BC. The Cantonese began to settle in the area about 100 BC; later came the Hakka, and by the mid-17th century the Hoklo. Hong Kong was the scene of the last struggles between the declining Ming dynasty and the rising Ch'ing, led by the Manchus. This is still an area of big uncertainties. Two forms of modern Chinese-character rendition of "Hoklo" have been attested in a syllabic dictionary published by western missionary Samuel Wells Williams. According to the preface of this book, hok-lò 福佬 would be the original form, and 學佬 the Cantonese rendition of the same term. Another appearance of the Chinese-character rendition seems to exists in a Chinese-translation copy of the French Jesuit work "Géographie de l'empire de Chine" by Louis Richard, published in 1905, Impr. de la Mission catholique à l'orphelinat de T'ou-sè-wè (Chang-hai). Because we do not have the original text neither in French nor in Chinese, we will refrain from placing any explicit citation here, despite having found some second-hand information. The publishing institution is known as St. Ignatius Cathedral of Shanghai in English, 徐家匯天主教堂 in Chinese. An English translation was published in 1908, however, this is a revised version, so it may differ somewhat from the original French version, and may differ from the Chinese version. "Comprehensive geography of the Chinese empire and dependencies"
In the English version, the Chinese character used for Hoklo is 學老, which can be found on page 207.